Of the many beautiful approaches to ports all over the Mediterranean the arrival in Mahón (or Maó) in Menorca must be one of the most spectacular. Cruise ships enter a narrow channel on the south-east coast of the island then slowly sail for 5km beyond the islands of Lazareto and Quarantena before reaching the quayside. 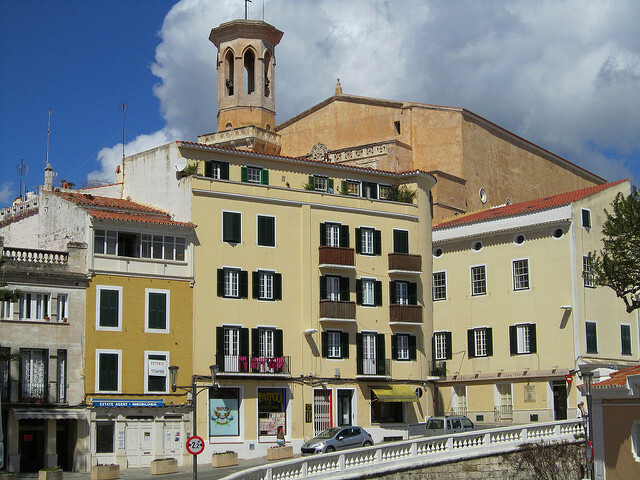 British visitors to Mahón (Maó) are often struck by the charming familiarity of Menorca’s capital city. This is largely due to the Georgian-style buildings and the gin distillery which are reminders of Britain’s control of the island during the 18th century. This historic episode dates back to 1715 when the Royal Navy established a dockyard in the Port of Mahón as its base in the Mediterranean. Another reminder of this era is Saint Philip’s Castle (Castillo de San Felipe) which you will see from the port side of your ship as you enter Mahón harbour. On two occasions during the Seven Years’ War (1756-1763) this mighty fort failed to protect British control of the island. However, it wasn’t the British who first recognised the advantages of what is one of the world’s largest and deepest natural harbours. The Port of Mahón has been an important naval base as far back as the 3rd century BC and has served as a base for the fleets of all the civilizations who have settled on the island over many centuries including the Phoenicians, Carthaginians, Romans and Moors. Today the Port of Mahón is a busy ferry port dealing with vessels to and from Barcelona, Valencia and Palma de Mallorca as well as a growing number of cruise ship arrivals (currently around 70,000 passengers per year). 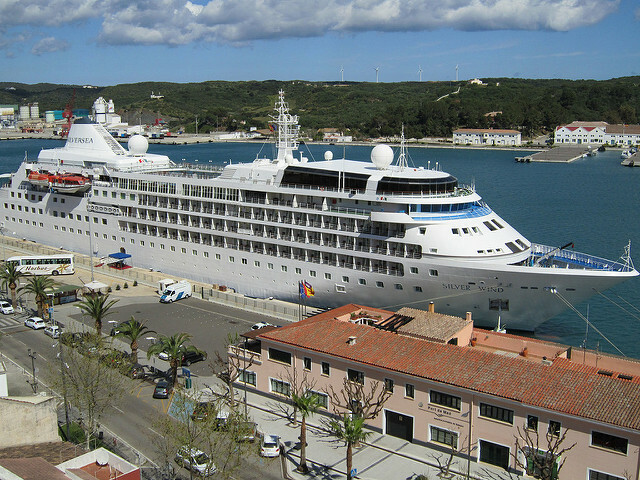 Whilst it is able to accommodate up to three large cruise ships at any one time the Balearic Ports Authority are keen to promote it as a destination for mid and small sized ships. The Port of Mahón is only about a 650 metre walk from Plaça de la Conquesta in the centre of the old town following the winding Costa de ses Voltes. Most passengers, however, prefer to walk directly up the 100-plus steps which lead from the port directly to the city centre. In both cases the steep climb may prove a little challenging in which case taxis are available to provide transport into town. Alternatively, passengers can wait for the Mahón Express which is a land train that takes passengers on a 50 minute tour of the town. Some walking is recommended, however, as it cannot enter much of the historic centre. Xoriguer Gin Distillery (Moll de Ponent): Located on the quayside, just a short stroll from where your ship docks, this gin distillery is perhaps the sharpest reminder of the occupation of the island by the English during the 18th century. Visitors can go inside and view the distilling equipment then enjoy a gin tasting in the small shop where you can buy a bottle to take away with you. Iglesia de Santa María (Plaza de la Constitución): Once you’ve made your way up into the old town from the port you should head for Plaça de la Conquesta and visit this 18th century church which was built on a former Gothic structure from the 13th century. It may not look spectacular from the outside but the inside is quite beautiful. The highlight of its interior is the magnificent pipe-organ inside which was donated to the church during the Spanish Civil War. Most days (except Sunday) visitors can attend a half-hour organ recital at 1pm which is highly recommended. Iglesia del Carmen (Placa Del Carme, 9): Just a couple of minutes’ walk away to the south-east from Plaça de la Conquesta, this is another beautiful 18th century church which is the largest religious building in Mahón. In the cloisters next to the church is the Mercado del Claustro del Cármen, a fresh food market frequented by locals. From Plaça de la Miranda to the east of the market you get great views back down to the port. Mercado de Pescados (Plaça del Carme): Just a few metres west of the Claustre del Carme Market is Mahón’s fish market which is a real highlight for visitors who happen to stumble upon it. It’s divided into an area of fresh fish stalls which you can wander around and another section filled with tapas bars. Grab yourself a table and order some of the best seafood tapas you’re ever likely to come across and enjoy a lively lunch in the company of local shoppers and market workers. Museo de Menorca (Av. Doctor Guardia): To the west of town overlooking the harbour, this delightful venue which is housed in the former Convent of San Francisco is a must for anyone interested in learning a little about the history of the island of Menorca. Exhibits date back to prehistoric times and include artefacts from all the civilizations which have settled on the island over the centuries. Punta Prima Beach: All around the island there are beautiful beaches but if you’re just in port for a short while and woud like to head for one nearby for a couple of hours then go to La Platja de Punta Prima which lies just 10km south of Mahón. With turquoise waters and beautiful white sand it’s an idyllic place to go for a swim and enjoy lunch at one of the restaurants overlooking the beach. You can get there by taxi or on bus number 92 from the main bus station (just off Plaça de Esplanada). Cuitadella: Located on the west coast, some 48km west of Mahón Port, is Menorca’s 2nd largest urban centre which was the capital of the island before the British changed it to Mahón. This charming city remain’s the island’s religious centre and is home to the Catedral de Santa María de Ciudadela which dates back to 1287 and is the island’s main cathedral. Fornells: Just 26km away on the northern tip of the island, Fornells is a quaint fishing village whose harbour is occupied by traditional boats known as Llauts which are used to catch lobster. It’s an ideal place to enjoy a typical lunch of Caldereta de Langosta (lobster stew) overlooking the bay. Prehistoric Sites: Towards the end of the 2nd millennium BC the Talaiotic Culture is known to have existed in Menorca. As you travel around the island look out for archaeological sites consisting of small rock structures which have been uncovered from that era. The closest ones to Mahón Port are Trepucó (4km south) and El Talatí de Dalt (5km west). The most famous of these sites is Naveta d’Es Tudons which is one of the island’s most visited attractions lying 42km to the west on the road into Ciutadella. Menorca Airport: The island’s airport lies just 6km south-west of Mahón so is easily accessible by Airport Bus (number 10) which goes to the city’s main bus terminal. Taxis and private shuttle operators are also widely available. Hotels in Mahón: If you’re staying on the island before or after your cruise you’ll find a good selection of Mahón hotels at Booking.com.